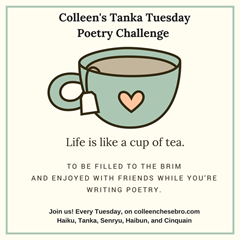 This entry was posted in Challenges and tagged Annette Rochelle Aben Communicates, colleen's weekly tanka tuesday poetry challenge myth & write, create, dragons, synonyms only, tales. Bookmark the permalink. I do like this, Annette. Simple yet very effective. Excellent! Great poem! Love that it was featured, Annette.